Journeys West: Pioneer Tales from the Wagon Trail is the Tread of Pioneers Museum�s newest exhibit. The exhibit chronicles the stories of Northwest Colorado�s pioneer wagon travelers. Nearly every item on display was carried to Routt County in a pioneer�s wagon. 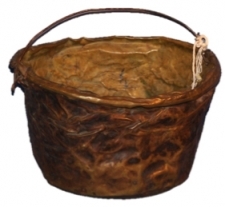 One such item was a copper pot that was brought by Steamboat Springs� founding family, the Crawfords. The James H. Crawford family came to Colorado in 1873 from Missouri. The territory was rugged and mostly unknown. The Crawford family�s journey from Missouri to Steamboat Springs is described in detail in the new exhibit, including the astonishing story of traversing Rollins Pass before the road was completed. Though the family brought two wagons and made stops along the way to restock food, space to carry supplies was limited. Every item that made it all the way from Missouri to Steamboat Springs was important. Not to mention the fact that the item was then used for years, saved by family, and THEN nearly one hundred years later, donated to the Tread of Pioneers Museum. Amazing! So why a copper pot? I cannot be entirely sure why the copper pot was one of the items the Crawfords brought with them, after all is it one hundred years later, but I do know that copper cooking tools were treasured items. Copper heats quickly and uniformly, and it reaches hot temperatures with little fuel needed. If you are trying to conserve your fuel, a copper cooking pot would be a good choice. Plus, food does not stick to copper�a must when wasting food is not an option. According to our collection records, this pot was coveted for pickling pickles because the copper metal helped keep the pickles green and crisp. At first, I shrugged my shoulders at this piece of information, but when I stopped and thought about what a big part of the pioneers� diet was canned and preserved food I realized that having one food that was colorful and crisp would have been a very welcome treat. After serving as a cooking and pickling pot, it was used in the family barn to hold chicken feed, which led to its current dented appearance. While I was not able to find a reference to this copper pot in any of the Crawford�s stories about their trip West, the exhibit is full of many other interesting quotes and stories about how the Crawfords became the first family to make the journey and to settle what would become Steamboat Springs. 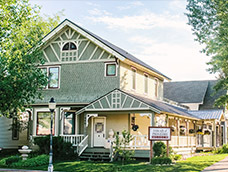 To see more items and read firsthand accounts from pioneers traveling by wagon to Steamboat Springs, come visit the Journeys West exhibit at the Tread of Pioneers Museum. In the next blog, I will include the most amazing story about another pioneer family conquering the mountains in order to get to the Steamboat Springs area. Here�s a teaser� it includes dismantling the wagon, carrying the parts downhill and putting it back together!